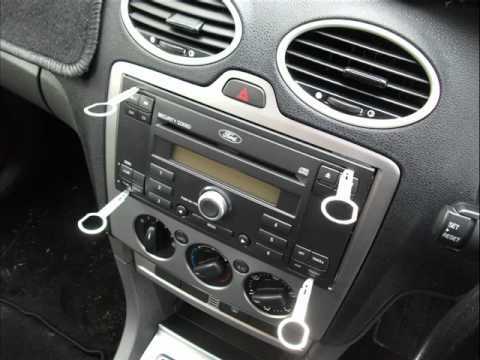 To find the unique serial number for the Ford CD Player or the Sat Nav System you can either use the preset buttons on the front of the radio or by removing the unit from the dashboard of the car or van using a set of Radio Removal Keys, these can be purchased from a local car audio accessories shop or Halfords store. You will find the serial number beginning with M, V, BP or C7 & part number beginning with 76 printed on a Ford label, you only need the part number for the Sat Nav Infotainment systems made by Blaupunkt & Bosch. If you need any help just telephone 020 8243 8962 from 9 am to 6 pm. 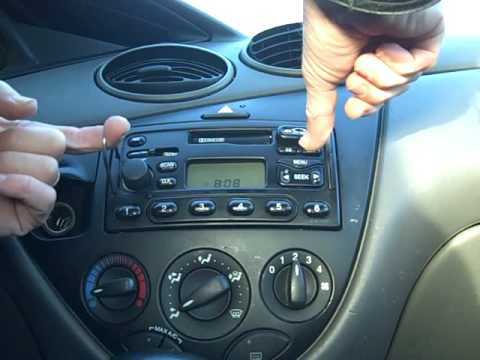 How To Remove A Double Din Ford Radio. You will find 2 small slots on the front left and right of the unit, insert the radio removal keys into the slots until they are in place (you should feel a click). Once the radio removal keys are in pull the radio out. Please note that the radio will have the power adapter and antenna plugged in so you may have to unplug them to see the serial number which you will find printed on a Ford label or etched into the casing of the radio. How To Remove A Single Din Ford Radio. You will find 2 small holes on the front left and right of the unit, insert the radio removal keys into the holes until they are in place (you should feel a click). Once the radio removal keys are in pull the radio out. Please note that the radio will have the power adapter and antenna plugged in so you may have to unplug them to see the serial number which you will find printed on a Ford label or etched into the casing of the radio. Page Updated: 7:17pm, 8th August 2018.